The new series of three Presentation Sets replaced those previously offered. 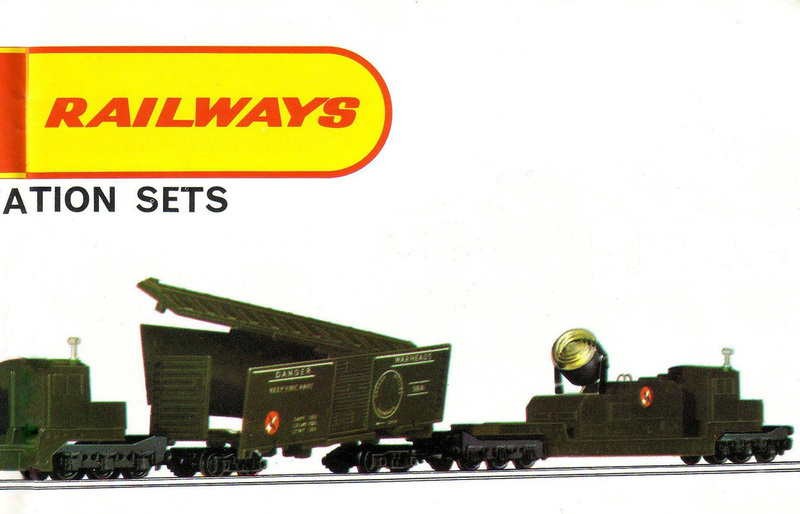 The set boxes described the contents as a Railway Gift Set rather than as a Presentation Set as stated in the catalogue. The price lists referred to them as Railway Gift Sets; such was the continued confusion and disparity of description of set names and types. Packaging, again, was of a rather poor quality white surfaced corrugated cardboard. The various sized box trays appear to have been formed by folding the cardboard inwards to form the open tray base. Separate packing inserts were included. The trays and contents were shrink-wrapped but they were probably issued without box lids. The printing was in black with the packing inserts carrying the ‘Tri-ang' logo followed by 'RAILWAY GIFT SET' and the individual set details both in English and an equivalent translation in French. The issued set was composed of the R.444 CN Coach, R.446 CN Diner, R.447 CN Baggage Car (all in 'silver & black' livery). Retail price was $8.00. 'RAILWAY GIFT SET' followed by ‘NO. PS 167’, ‘•DINING CAR •DAY COACH •BAGGAGE CAR’, ‘LE CHAMPLAIN AUTHENTIC SCALE’, ‘MODELS OF CANADIAN NATIONAL TRAIN’, ‘OPERATING BETWEEN MONTREAL-QUEBEC’. PS.267 Work Train Presentation Set or Work Train Gift Set 4pc. The set was composed of the R.111 CN Hopper Car, R.138 CN Snow Plough, R.344 Track Cleaning Car and R.234 CN Flat Car. The retail price was $8.00. Examples of this set are known to exist. The illustrated set was composed of the R.128 Helicopter Car, R.343K 4-Rocket Launching Car, R.249K Exploding Car and R.341K Searchlight Car. The May 1, 1968 Roland G. Hornby Price List indicates that the retail price was to be $14.00. There are no records of batches of the Battle Space versions of these four models being dispatched to Canada at this time. Indeed, the NATO green predecessors of the Battle Space series were available in shops in Canada well into 1970. Also, Battle Space models in Canada are quite scarce to find. 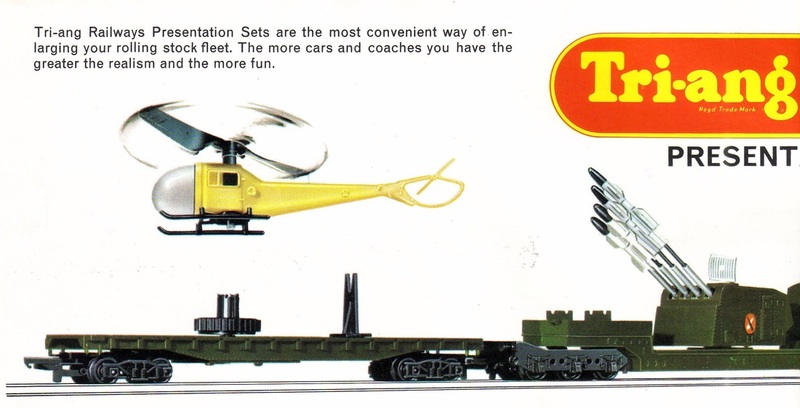 The set also featured in the 1969 Catalogue as set number R.367 ‘All-Action Presentation Set’. It was listed in the February 24, 1969 Suggested Retail Price List but no price was quoted. It is most unlikely that either of these sets were ever made, at least not as illustrated. R.641 Davy Crockett Presentation Set. Retail price was $12.00 Canadian. Retail price was $20.00 Canadian.